As part of our continued effort to be a positive driving force in the Sandusky community, Mathews Ford has teamed up with Serving Our Seniors to assist in the welfare of our elderly. 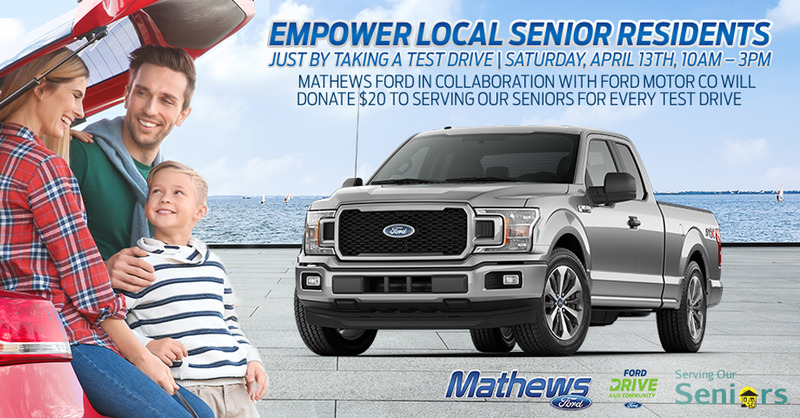 On Saturday, April 13th, from 10 am to 3 pm, during our Drive 4 Ur Community event, Mathews Ford will donate $20 per test drive to Serving Our Seniors. Serving Our Seniors is an organization dedicated to helping Erie County residents 60 years of age and older maintain their independence. From drug costs, home repairs, hot meals and transportation to helping them when they’re confused whether to respond to a certain piece of mail, Serving Our Seniors offers many programs to help our seniors with all their needs. One test drive is all it takes to donate to a wonderful cause. With more than 200 new, pre-owned and certified pre-owned vehicles to choose from, the hardest decision will be which vehicle to test-drive! Saturday, April 13th, bring in the entire family to test-drive and helps us create a secured future for Erie County’s most revered residents.